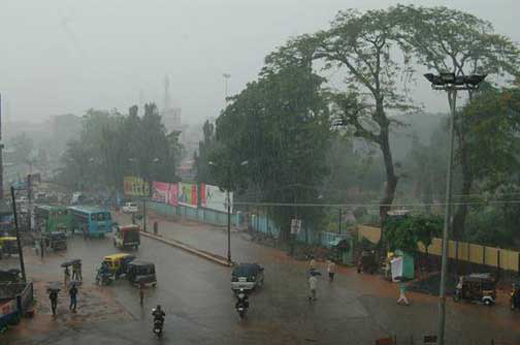 Mangaluru, May 19, 2015: The regular showers of rain in the last few days have made people in the region confused. As per Met information, South-West monsoon is expected to arrive over Kerala on May 30, error of plus or minus 4 days has been set. In Karnataka, from May 12 to May 18 recorded 95% surplus rainfall is recorded. The normal weighted average rainfall of 20.1mm in south-interior, north-interior, malnad and coastal parts, state recorded rainfall of 39.2mm. For 24-hours period ending 8.30am on May 18, four geographical regions received 5.7mm actual weighted average rainfall against normal weighted average rainfall of 3.2mm, a 78% surplus departure from the weighted-average normal. More than 90% relative humidity has been recorded in 51% geographical area in Karnataka state. Less than 25% of relative humidity has been recorded in 18% geographical area in the state. Rainfall over the state is considered as scattered since 40% of hoblis and gram panchayats recorded rainfall of 2.5mm. Heavy rain was recorded in 31 gram panchayats; rather heavy rain in 187 gram panchayats; moderate rain in 815 gram panchayats; light rain in 503 gram panchayats; very light rain in 503 gram panchayats; and no rainfall in remaining 2,857 GPs across the state. So, be prepared with your monsoon preparations now.